Ancient Near Easterners were fond of describing banquets in their story-telling. More often than not, these stories devolve into a depiction of violence. (After all, since when has anyone enjoyed a story about people eating?). Here you can find a few of my favorite banquet stories, culled from a book that I'm trying to publish, A Feast of Fat Things. In this book, a product of my doctoral research, I explain how this motif developed, and why. Most importantly, I show how the ancient pre-battle banquet motif can help you appreciate the Sacrament of the Eucharist in a new and exciting way that will directly effect your Christian life. Enuma Elish The heartwarming tale of how Marduk killed his grandmother. 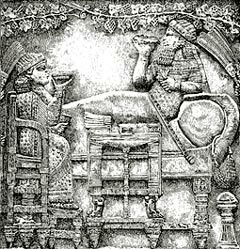 The Baal Epic An ancient, Ugaritic book of dining etiquette. Samson's Wedding Wrumble Why Philistines think twice before inviting Danites to parties. 'Elpful 'Ints from Esther Advice for all of you ladies out there. The Eschatological Banquet What all of these stories contribute to theology.